Nowadays, the application of laser cutting machine has become more and more extensive, especially in the field of sheet metal products processing. Laser processing has the advantages of high machining precision, good surface quality, low processing noise and small vibration of equipment. However, laser cutting also has the disadvantages of slow processing speed, low material utilization rate and high comprehensive processing cost. Laser cutting machine adopts non-contact machining principle. Compared with ordinary multi-station punch processing, no special mold is needed, so its processing scope and conditions are limited. According to the requirements of product design, the complex shape can be cut at will. It is suitable for single trial production and small batch production, which can quickly satisfy the customers’ pursuit of personalized products. In the thick plate processing, laser cutting processing advantages are more obvious. The cutting thickness of steel plate is more than 20mm, the general multi-station presses can only process 3 ~ 8mm. Because the laser cutting machine uses the moving laser cutting head to process the plate, therefore it has longer back and forth stroke. Compared with the multi-station punching machine, the processing speed is slow, the total processing time is long, the efficiency is low, and the auxiliary gas dosage is large. Therefore, the comprehensive cost of laser cutting processing is much higher than that of punch. How to shorten the laser cutting time and improve the efficiency of laser cutting is the concern of many manufacturers. The efficiency and economic benefit of the laser cutting machine are improved, which is mainly to shorten the time of laser cutting and improve the utilization rate of the plate. It is necessary not only to study the shortest air travel of laser cutting but also to study the problems such as drilling time, cutting pause and nesting. 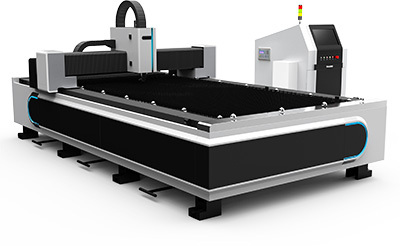 The laser cutting path can be divided into two parts, including the cutting path and the process path for the removal or separation of the material. The cutting path is the effective working path, the time consumed is the effective cutting time, while the empty stroke is the invalid path, and the time consumed is the invalid working time. For 1 CNC laser cutting machine, when using the maximum power processing parts, the effective cutting speed is certain when the quality is guaranteed. In order to improve cutting efficiency and shorten the time of invalid cutting and reduce cutting path length is the main method. In addition, adjust the process parameters of the cutting process appropriately and select different perforation methods can also save the time of cutting processing consumption. In the case of punching holes, such as the adjustment of the external light path, the gathering beam, the vertical adjustment, etc. belong to the process adjustment pause. The plate laser cutting process is divided into two parts, including components and residual materials. The workpieces that are cut off by the design drawings are really useful parts, and the rest is irregular, usually as waste disposal. Therefore, the effective utilization ratio of laser cutting material = the area of useful parts/total area of the sheet * 100%. In order to improve the utilization rate of the plate, we must reduce the residual material after laser cutting. Now the laser cutting equipment can be used to optimize the nesting function. It is the main way to reduce the cutting spacing and edge distance of the various parts. Certainly also can choose the small size raw material plate according to the workpiece size, or by the actual size of the part to make the non-standard size plate, to improve the actual utilization of the plate. The off-line programming software of the laser cutting machine is used to optimize the setting of sheet material and process, so as to improve the utilization rate and cutting efficiency. The parts with regular shape adopt borrow edge and share edge when nesting. When cutting (figure 1), one edge of the two parts is the shared edge, so the cutting path will be shortened greatly, thus reducing the cutting time. On one sheet metal, you can’t make all parts share one edge. Generally, it is recommended that 2 ~ 4 parts should be used as a group to share the edge. Otherwise, all the parts share the edge, which will cause the parts to be unstable on the workbench. Since the finished parts will be turned up, the parts will be processed on the edge of the finished product parts, which will interfere and damage the cutting head. In order to improve the precision of the final part, the bridge method can be used when cutting with a shared edge, which is to make precise and micro connections between the parts in the nesting. (figure 2) The distance is the diameter of the laser spot. According to statistics, the actual cutting path can be reduced by 30%, and the material utilization rate is increased by 8% if adopt shared edge cutting. Usually, the machine will lift up to a certain height after cutting an outline, and then move to the cutting position of the next contour for piercing and cutting. The purpose of this is to prevent collides with the cut piece when the cutting head from moving from the current profile to the next cutting profile. However, once the cutting path of the cutting head is optimized, or the contour of micro-connection is used, the lifting motion of the cutting head can be removed to improve the cutting efficiency of the laser cutter. FIG. 3a shows the lifting action of the cutting head. Figure 3b shows that the cutting head is not lifted after optimization and setting in the programming software. Move directly to the cutting position of the next contour. Note that after using the above optimization method, you must pay attention to the movement track of the cutting head. In other words, the cutting head cannot be passed over the finished contour, as shown in figure 3. Before laser hole cutting, make a hole in plate first. After the material is irradiated by a continuous laser, a pit is formed in the center, and the molten material is removed by the working airflow with the laser beam to form a hole. This hole is similar to the threaded hole through thread cutting. The laser beam is used for contour cutting at the beginning point of processing. Normally, the line direction of the flight path laser beam is perpendicular to the tangent direction of the cut contour of the processed part. 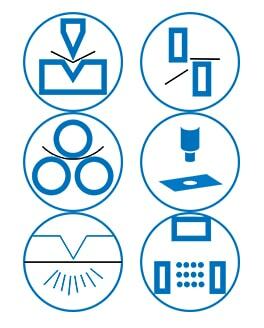 There are many factors that influence the quality of laser drilling. It should be based on the principle and characteristics of drilling, and the parameters of drilling must be analyzed and understood to optimize the processing technology. Use different puncture technology and processing technology for different parts contours. (2) The common puncture, which is the pulse mode puncture, adopt high peak power pulsed laser to melt or vaporize a small amount of material. Each pulse of light produces only small particles of spray, which is gradually deepened, so it takes a few seconds for the thick plate to perforate. The advantage is that the piercing quality is high and the cutting quality is guaranteed. The disadvantage is that it takes a long time and requires some debugging experience, and the puncture time increases with the thickness of the plate. (3) Quick puncture, namely blasting perforation. The material formed a pit in the center after continuous laser irradiation. The advantage is that the puncture time is short. The disadvantage is big thorn perforation. If the position setting is not good, it will affect the contour, thus affecting the cutting quality. The puncture time is within 1s. For thick plate cutting, especially large contour cutting, such as carbon steel plate above 4mm with a diameter of more than 10mm. It is advisable to use quick puncture instead of ordinary puncture. However, before setting the quick puncture, it is required to adjust the length of the cut line properly (Quick puncture holes have large aperture and rough surface, requiring longer lead-in lines to correct cutting quality). Because of the process needs, the parts are usually reserved in the nesting area. For example, the spacing between the parts or the distance of the outer contour of the plate. Proper reduction of spacing or the use of a shared edge can be used to save the plate. 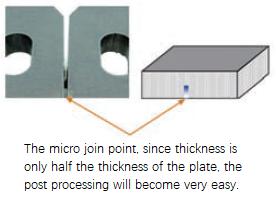 In order to explain how to shorten the laser cutting time and improve the utilization rate of the plate, this blog post summarized 4 methods including adopt shared edge cutting, optimize the sheet material, reduce the cutting head lifting motion, and choose the punching method reasonably. Through practical verification, to utilize the above methods comprehensively can effectively improve work efficiency, reduce waste and improve economic benefits.